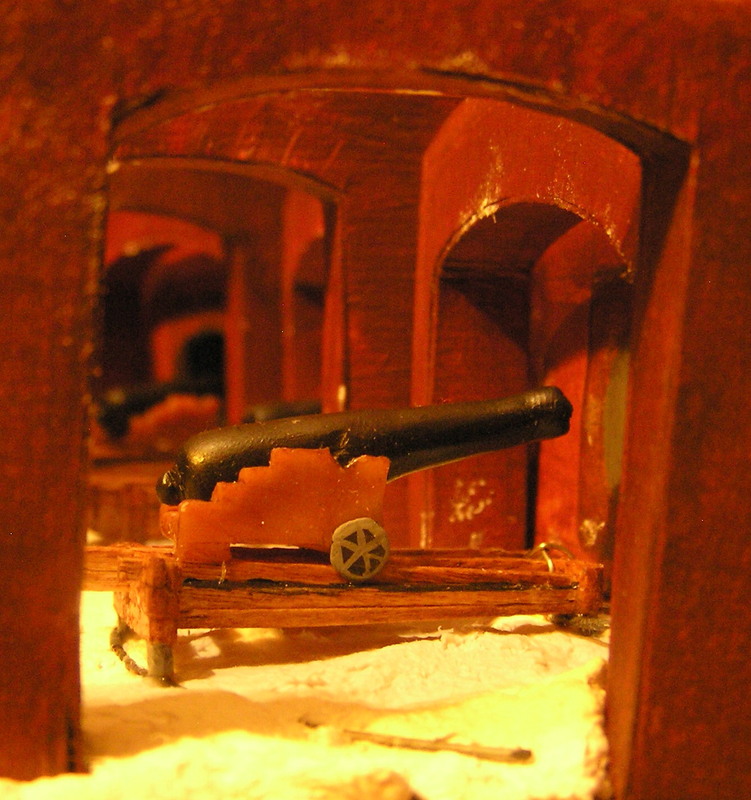 We started this diorama in 2011 in honor of the 150th anniversary of the bombardment of Fort Sumter. This is where the first shots of the Civil War were fired. 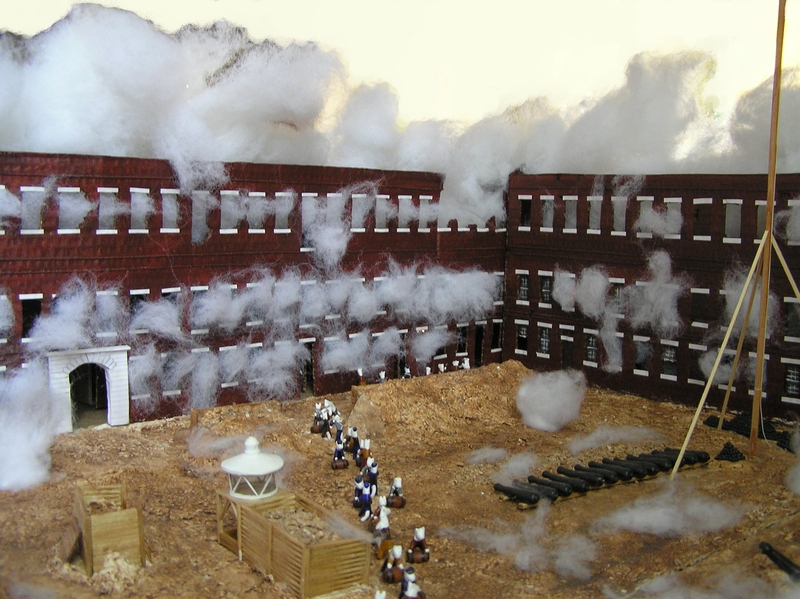 The diorama shows a point during the second day of the bombardment, April 13, 1861. This moment in time might not seem all that important at first glance. What are the men doing strung across the parade ground? Rolling barrels of gunpowder, of all things. In fact, they were working desperately to save themselves and the fort from being blown up! The powder magazine was housed in the officers’ quarters, which had caught fire. By the second day of fighting, the fire was coming dangerously close to the powder magazine and could not be stopped. If it reached the powder stored in the magazine and set that off, the explosion would be catastrophic. Fort Sumter during the second day of bombardment. The only thing left to do was to try to get the powder out of the magazine. Every man who wasn’t working a cannon helped to form a line across the parade ground to roll the powder barrels to an area they thought would be safer. Of course, all the time they were doing that, Confederate shot was raining down and exploding all over the parade ground. A spark to one of the barrels would have meant death to the men around it. Thankfully, no one was hit and they managed to salvage 50-100 barrels before they had to shut the door, bank it with dirt, and hope for the best. Later in the day, they had to throw many of the barrels out of the fort to keep them from exploding inside it, and a shot jammed the magazine door shut, leaving them with only five barrels of gunpowder, total. The garrison surrendered later that day. A 32-pdr in the casemate. These cannons were too small to do much damage. Take time to notice some details on this diorama. Why is the flag at half-staff? The men in the fort had dipped the colors to signal the fleet just outside the harbor, but as they did so, a shot hit the flagstaff and damaged it such that they could not raise the colors again. 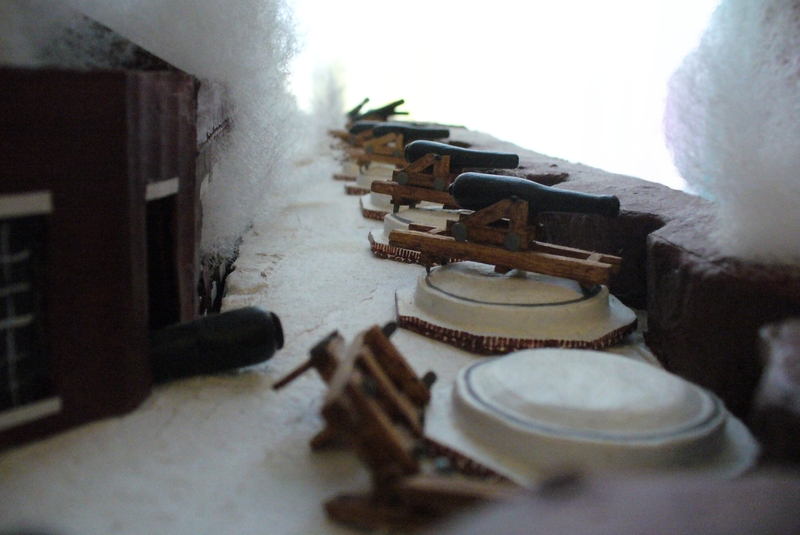 You’ll see that the big guns on the right side of the diorama are recoiled. Pvt. John Carmody had snuck upstairs the day before, against orders, and fired the guns on that side of the fort. Why? Because the cannons on the lower level were smaller, and it was frustrating when they didn’t do much damage to the Confederate positions. The cannons on the top (“barbette”) tier of the fort were bigger, but the barbette tier was much too exposed to enemy fire. The garrison didn’t have men to waste up there, so orders were to stay downstairs. The guns fired by Pvt. Carmody and the ten-inch Columbiad fired by the sergeants. You will also see a dismounted cannon, the barrel of which is halfway sticking out of a stair tower. A little howitzer is dismounted next to its carriage. A couple of sergeants had been frustrated, too, and snuck upstairs just like Pvt. Carmody. They fired this Columbiad, then couldn’t run it forward again because that would have taken eight men. So they fired it from the recoiled position. The second recoil dismounted the gun! These cannon positions are taken from photographs taken in the days following the surrender of the fort. We think it’s pretty exciting to match up the accounts with the period photographs, and bring it all to 3-D. We hope it will give you a new perspective on history, too!